When I was asked to review the new CD Childsplay: Waiting for the Dawn I was hesitant, as folk/fiddle music is not really my milieu. However, the group is based on all the instruments being made by a single luthier, Bob Childs. So rather than comment specifically on the music, whether it is a traditional or original composition by one of the band’s members, or on the playing (although there is some excellent fiddle playing), I will speak about the sound – which is more than just a little unique. “It is often said that when played soulfully the violin, of all instruments, sounds the most like the human voice,” says Bob Childs. The CD starts with “Ratting Roaring Willie/High Drive” with vocals by Aoife O’Donovan which lends a sense of the intense sonorities found in the fiddle sustains of Childs’ instruments, as well as the edginess, the grit of the high energy music. It is a great way to start the album and certainly sets the mood for a fast paced romp through traditional folk music. As the CD continues, it is easy to relax into the wistful blend of folk music crafted on the concept of marrying the voice of the violin with the rich resonance of the human voice. There are moments where voices duet, with underpinnings of traditional folk double stops on the violin. It highlights just how beautiful these instruments are, how subtly emotional they can be creating nuances so similar it is impossible to tell which is which. The music has roots in Irish, Scottish, Cape Breton, Scandinavian, French Canadian, and American folk traditions. Although some of the numbers are original, the marriage is seamless, creating a sound as fresh and new as anything in the genre. Yet, it also tugs at the heart strings reaching deep into the “soul” of these musical roots to capture the essence of what this immigrant nation is all about – great music that has energy, life and hope. Even with all my enthusiasm I have done a disservice to this CD. This is not just a small ensemble playing fiddle tunes, but rather a twenty-one piece orchestra providing backup to each of these pieces. So, while there is some excellent fiddle playing, there is also a lush resonance which comes from an entire ensemble created a by single craftsman. Perhaps the best example of this is the sixth track, “Mothers of the Disappeared/The Evenstar”. A minute into the piece, the backing ensemble gets to shine with a collection of violins playing together. We really get to enjoy the satisfying, lavish sound of these instruments. 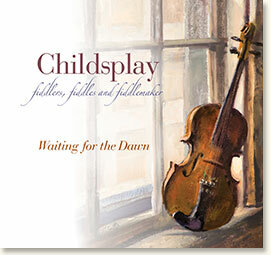 “Wating for the Dawn” isn’t a classical music CD, but I am so glad I’ve been introduced to the group Childsplay. They are more than a diversion from the norm, they are a whole new concept in creating something extraordinary.